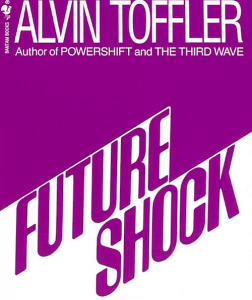 Alvin Toffler, author of Future Shock and editor of Learning for Tomorrow, died last month. He was 87. Toffler claimed that by the 1960s, Western culture was changing so rapidly that it disoriented us. Historians of course had been using modernization and its discontents to explain everything from the French Revolution and before, to the rise of the KKK during Reconstruction and after. 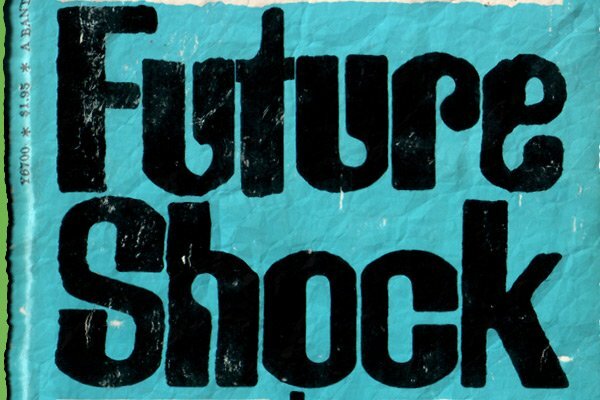 In the 1960s, history textbooks, however, never discussed modernization or future shock. Indeed, they never invoked the future in any meaningful way. Nor do they today. Instead, they close by imparting vapid inanities. “The American tradition remains strong — strong enough to meet the many challenges that lie ahead,” The American Adventure assures students; “the American adventure will surely continue.” Americans “were convinced that their free institutions, their great natural wealth, and the genius of the American people would enable the U. S. to continue to be — as it always has been — THE LAND OF PROMISE,” Land of Promise concludes. In short, all we need to do to prepare for the morrow is keep our collective chin up. History textbooks avoid serious consideration of the future because such reflection might be controversial. Not everyone would come to the same conclusion. Teachers might lose control of their classes or, more likely, get flak from some parents. Horrors! Of course, the traditional style of pedagogy, which we might call input/output, assumes that we want everyone in the room to give us the same “right answer” rather than develop the ability to think using historical information. There are other ways to end a history textbook. In 1972-74, I wrote a very different chapter to end Mississippi: Conflict & Change. Titled “Into the Future: 1967-2000,” it invited students to think analytically about what had happened in the past to cause Mississippi to be as it was in the present. Then they could project the state’s likely future development. The chapter treated migration into and out of Mississippi and within the state, in which we predicted “rural life itself is ending,” as everyone, farmers included, winds up intensively connected to urban America and the world. It also treated “Women in the Future of Mississippi,” asking students to contemplate what jobs, if any, would still be men-only in 2000. Pages on the likely future of school desegregation, then just underway, and the effects of desegregation on politics invited students to think about the hottest-button topic of that era. For young people to grow into competent citizens in a time of change, education must connect their roots in the past with images of desirable futures. This history of Mississippi makes the connection between the living past and a livable tomorrow. Its use would make Mississippi a path-breaker in the teaching of local history. That attempt at censorship had a happy ending, however. The two editors, Charles Sallis and myself, along with three school systems as co-plaintiffs, filed suit, “Loewen et al v Turnipseed et al,” in federal court. In 1980, we won, and the state was required to adopt the book. Pantheon published a second edition, and we added a new chapter, “Desegregation and Cultural Change, 1968-1980.” Our retitled final chapter, “Into the Future: 1971-2000,” required only minor adjustments, however, because most of our projections had been right. My point in this essay is not to tell that story, however. My point is to use Toffler’s death, and more importantly his work, to make an argument about all history textbooks. Surely all textbooks that reach the present should project into the future. Few do. Even today, more than 150 years after the end of slavery, most U.S. history textbooks avoid any treatment of the past that implies relevance to the present. Again, that would be controversial. Treating slavery is OK, because that’s over. Treating slavery’s handmaiden, racism, is not, because it continues. So textbooks leave the history of slavery, and of everything else, buried in the past, without relevance to the present, and with no implications for our future. .Lacy K. Ford Jr., “One Southern Profile: Modernization and the Development of White Terror in York County, 1856 — 1876” (Columbia: U. of SC M.A., 1976). .James W. Loewen, Charles Sallis, Jeanne Middleton, et al., Mississippi: Conflict & Change (NY: Pantheon, 1974), 309-35.